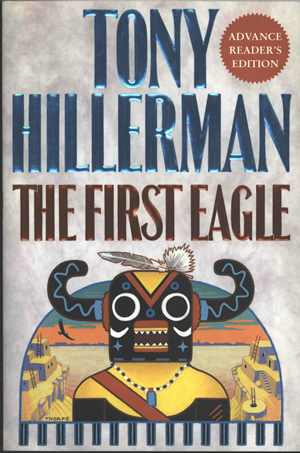 The back cover contains text, printed in black, describing the First Eagle campaign, along with a photo of Tony Hillerman. Binding: Full-color paper covers. The author name and title are printed in blue and red along the spine, with a detail of the front cover drawing and the publisher's imprint.